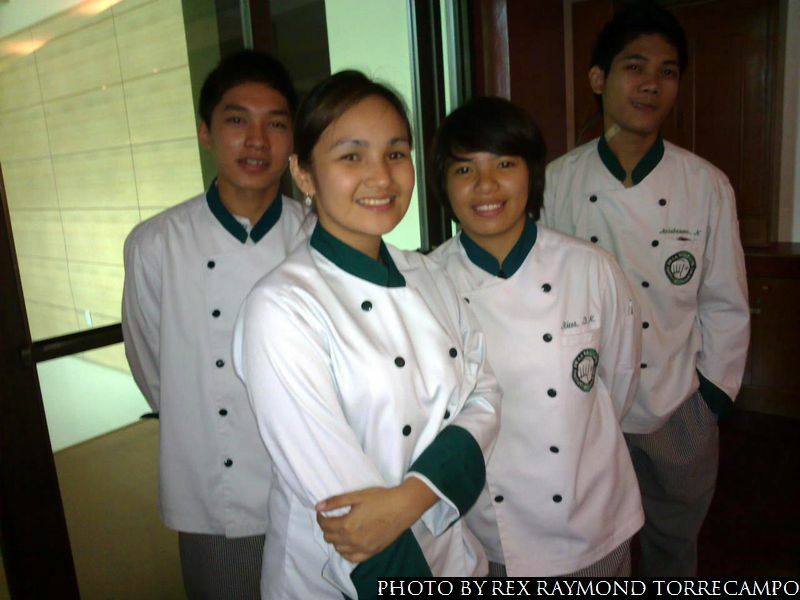 In school, there is this thing that we call the Chef’s Table. 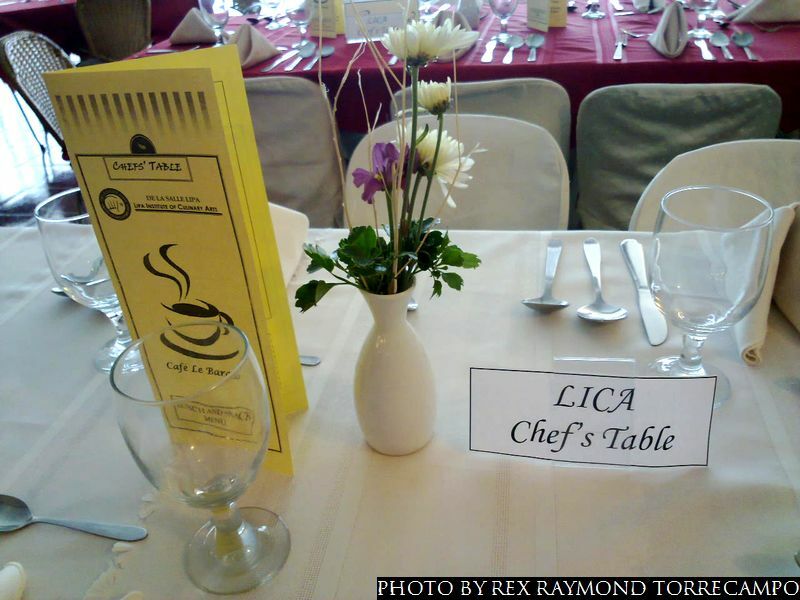 This is the venue for the budding chefs of our Lipa Culinary Arts Institution – which we shall henceforth refer to as simply LICA – to periodically display whatever culinary skills they have acquired whilst going through the 18-month program. There was a Chef’s Table held the other week; unfortunately, by the time I heard of it, I had already ordered lunch at the cafeteria. So, when I heard last week from the LICA Head that there was going to be another Chef’s Table scheduled today, I immediately made up my mind to be present. The event is held at the Chez Rafael, a laboratory hotel just across the building where I work. 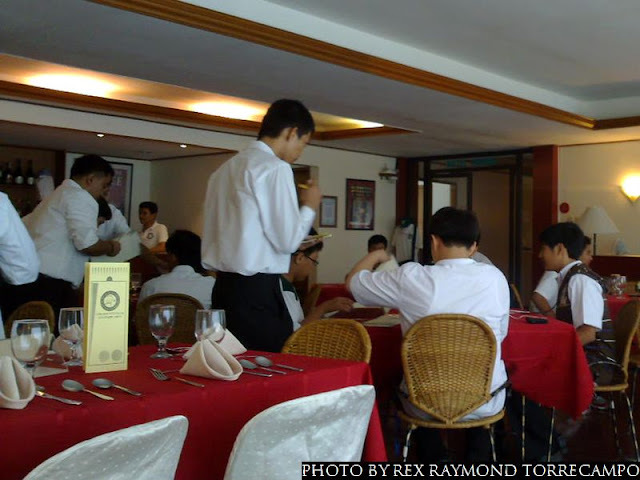 There is a restaurant on the second floor of the hotel that we call the Café Le Barako, a place where students of our HRM program also get to practice their waitering skills. The restaurant is open for most of the working day; and whenever there is a Chef’s Table scheduled, a few of the tables are reserved for the LICA offerings. I brought a colleague along with me so that I, at least, had some conversation while I sampled what our young chefs had to offer. 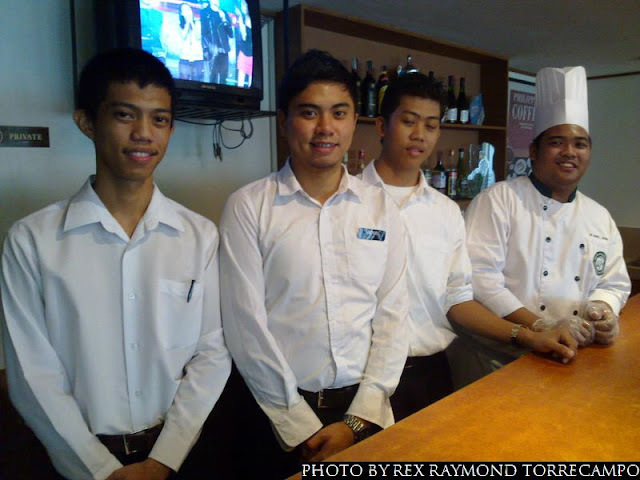 We were graciously received by a few of the chefs as well as by the HRM students who were on duty by the bar. The young lady – one of the chefs who helped to prepare lunch – who welcomed us was the best possible hostess. She had a pretty smiling face and told us she would be attending to our needs as she led us to our table. I am never a person for ceremony, so I told her as soon as I sat down that we would be ordering already. 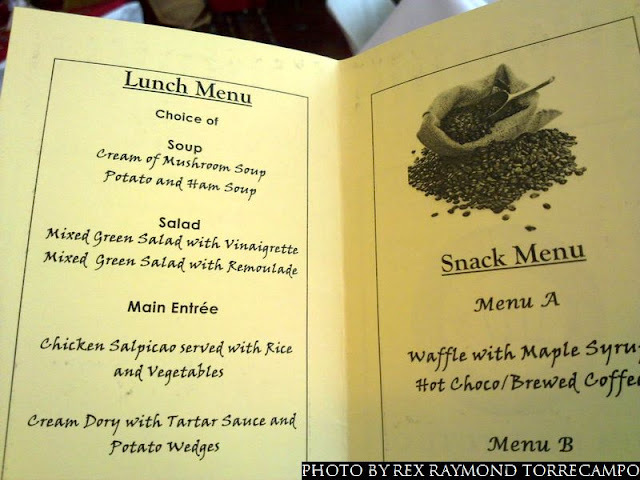 She smilingly showed me the menu that sat as part of the table décor and brought out scraps of paper on which to write our orders. At the very least, I get gas; at worst… So I ordered the Potato and Ham Soup. 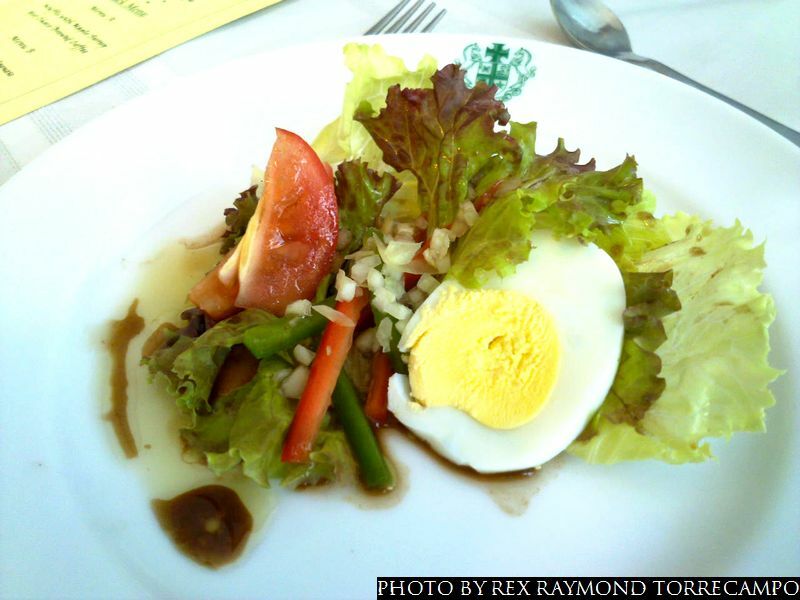 For salad, the choice was between Mixed Green Salad with Vinaigrette and the same with Remoulade. Now, my experience of fine dining is not at all extensive; and when I do get a bit of it, I am never the sort to even attempt to remember what the thing on my plate is called. So I asked what the Remoulade might be. The pleasant young lady explained, “Sir, that is something that has mayonnaise and ketchup.” Uhm, Mayonnaise… More alarm bells, because the two do not socialize very well inside my stomach; so I ordered the one with the vinaigrette. Do not get me wrong; my stomach is not really all that fussy. It is just that there are days when with milk or mayonnaise, I do not know where I will eventually end up. When she explained that it was fish, I immediately lost interest. 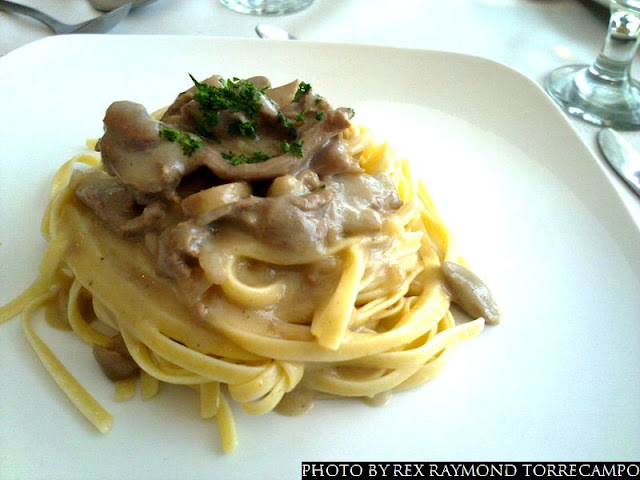 I wanted something on the heavy side, so I ordered Beef Stroganoff with Linguine. For dessert, Crema Catalan and Mango Crepe were available. 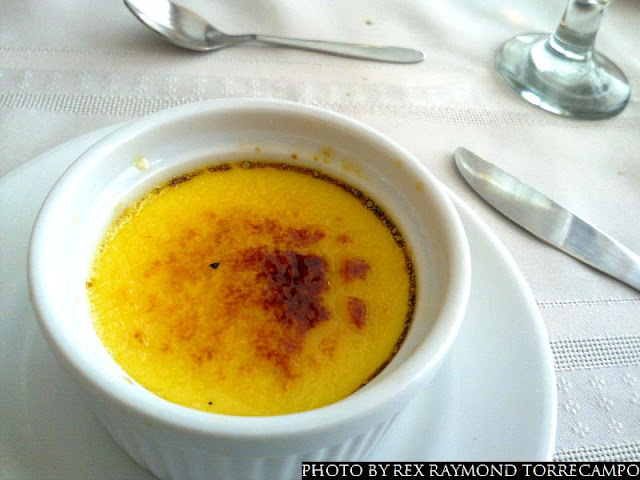 The former, we were told, was similar to leche flan but had a crispy crust. 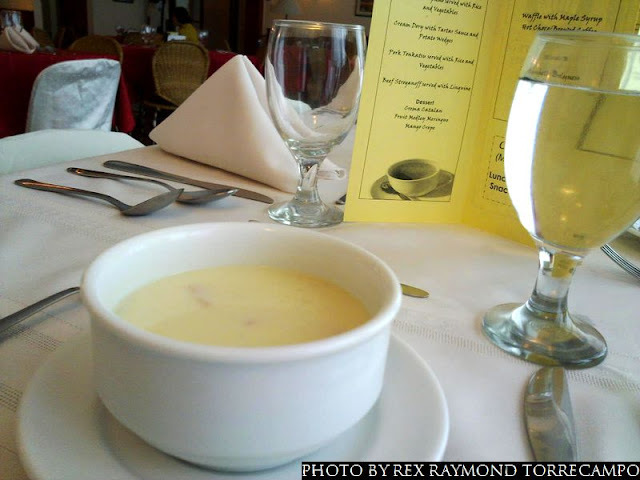 Since I am not really all that fond of mangoes, making up my mind was very easy – even if what I was ordering was, obviously, milk-based. I was really thinking to myself that a creamy dessert could not possibly be so bad, even if – on occasions – I rather tend to be lactose intolerant. As it happened, everything the chefs brought in – with the exception of the salad – had cream in it. As they say, no guts no glory… It was time to be brave! Right from the soup, that is! The ham and potatoes swam in impeccably white cream. My eyebrows, naturally, shot straight up. My companion’s pep talk had an irrefutable logic to it: “Sir, there is a very private washroom right next to your office.” Who could argue with that? And in all honesty, the soup was made in Heaven! Let us just say that, if I were on the road, you could have paid me a million and I still would have refused that soup. But, as my colleague so eloquently suggested, salvation – if necessary – was but a few footsteps away…. So I allowed myself to be swept up into the clouds by the sheer decadence of the soup, sipping away as though there was no tomorrow. The salad was, well… Put it this way: one of my forebears must have been a goat, because I will munch away at anything green. I thought the vinaigrette was good; but I have tasted better. Not that it mattered; I left nothing on the plate! Like the salad, the Beef Stroganoff was good, if a bit bland. I would not read too much into this because I do like my meat a bit on the salty side. The texture was excellent, though; and like our hostess promised, it was very, very filling. Last, there was the Crema Catalan! Whoever said lutô ng Diyos needed to be X-rated? If the soup was made in Heaven, the dessert was cooked by God Himself! Although it had a flimsy, chewy crust, everything melted in your mouth like the finest of candies. When the crème came into contact with the taste buds, pleasure just simply exploded in the brain! As we were finishing, in came some energetic Integrated School students eager for some chow. The Chez is a favorite for many of these kids, who would much prefer to pay that bit higher for spaghetti and some slices of bread rather than be caught in the mid-day cafeteria crush. Three of the new arrivals peeled off from the bunch and sat themselves on the LICA chairs. I had a smirk on my face as I watched the trio, mentioning to my companion that they probably did not have a clue what the Chef’s Table was all about. To their credit, the young chefs approached the kids gamely but respectfully – albeit, they did look suspicious. When the boys were told to choose from the menu on the table, that was when they started to look really fidgety. It was comical! After exchanging quizzical stares, the trio got up comically and moved to the neutral table. “Sabi ko na sa ‘yo mahal!” one blamed the other… May turô pa ‘yun!